Loft can be super hit or miss for me, sometimes I love everything in store, other times absolutely nothing speaks to me. Well y’all, everything is calling my name right now! 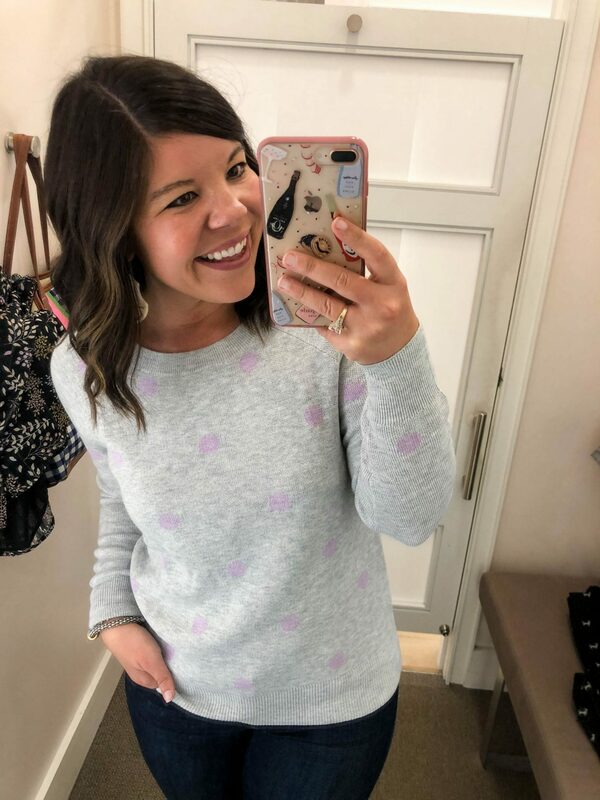 I totally stepped outside my comfort zone and tried on a bunch of new pieces for fall that I LOVED! You better believe the minute they announced their current 40% off sale (with code “NEWNOW”) I scooped up more of my fall favorites! I’m so excited to share all these pieces with you today! 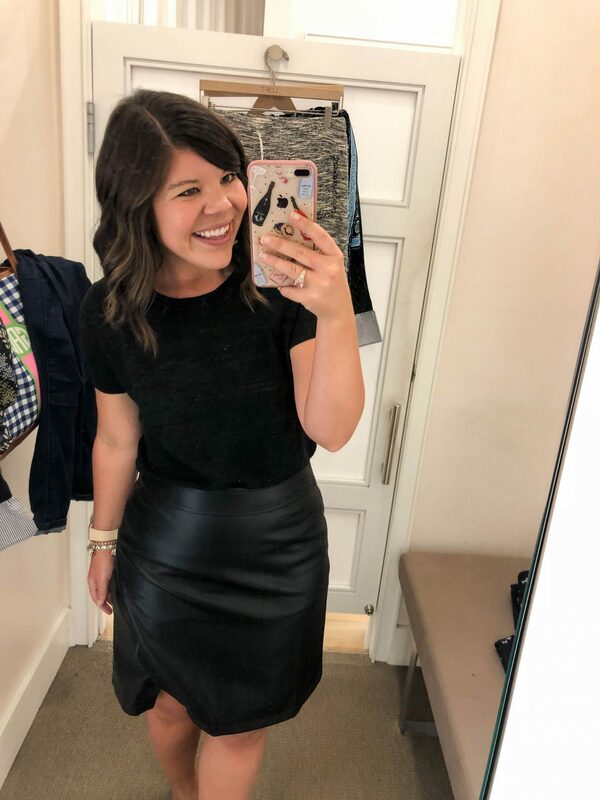 Ok, I don’t know who I am anymore because I made a beeline for leather skirts the second I walked in the store! Maybe it’s brainstorming all the ways to wear them in fall, but I am loving the chic and classic designs. 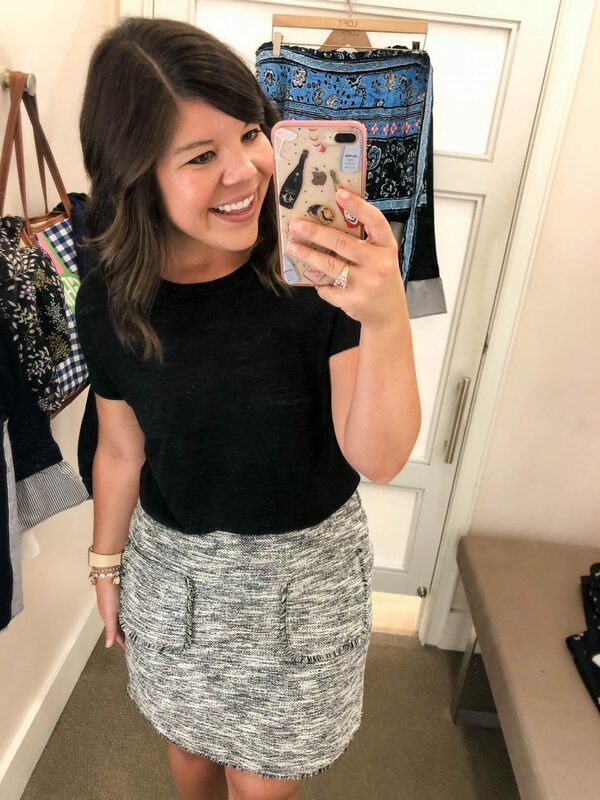 Normally I shy away from shift style skirts (my booty is a no-go for them) but I blame it on turning 30 that it’s changed my tastebuds and now I’m kind of loving the fit (or maybe I just found the right ones). I really don’t know who I am when I try on a black on black outfit and I’m obsessed! 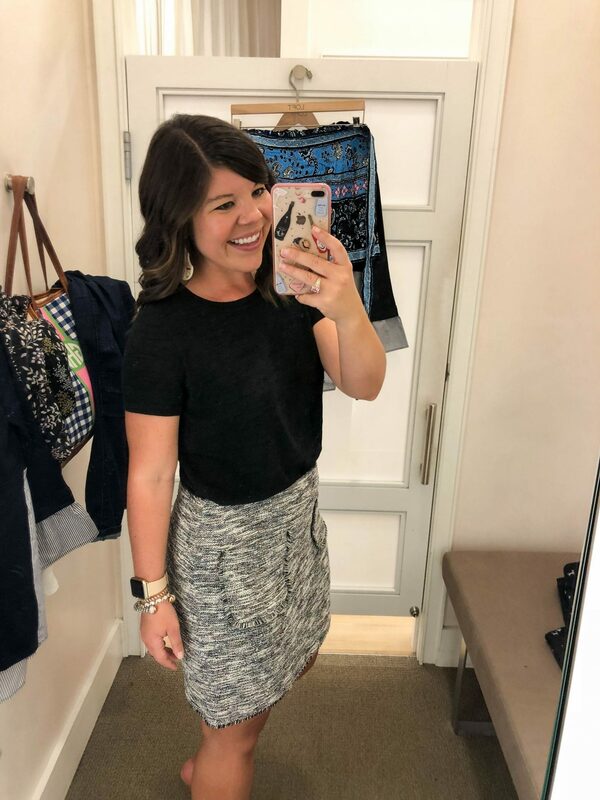 This skirt is SO good and will be a staple in your closet! Totally on a skirt kick right now! Normally tweed is more stiff and unmoving, but this piece is full of stretch and so comfortable. I’m pretty obsessed! Here’s a side view so you can see how good the fit is- super flattering! 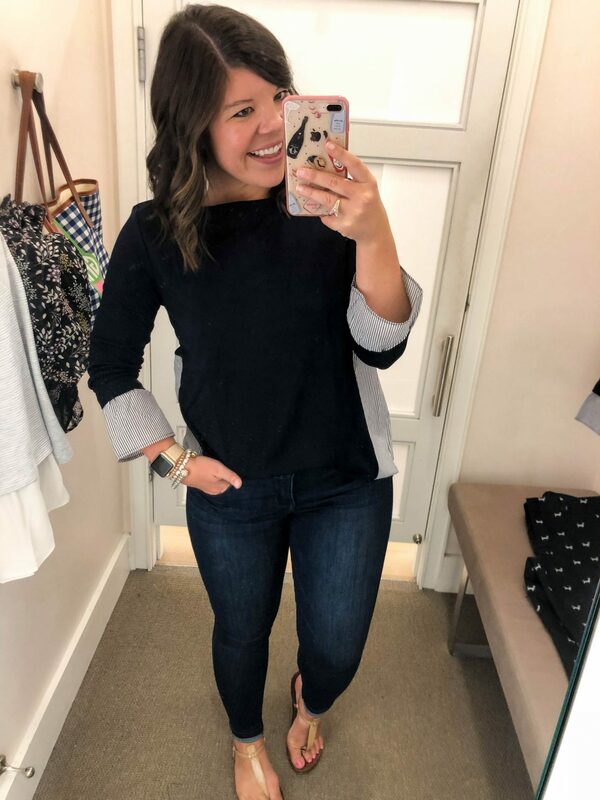 Loft always comes out with these “mixed media” tops each season and this one is particularly cute with the striped ruffle sleeves and striped panel on the back of the top. 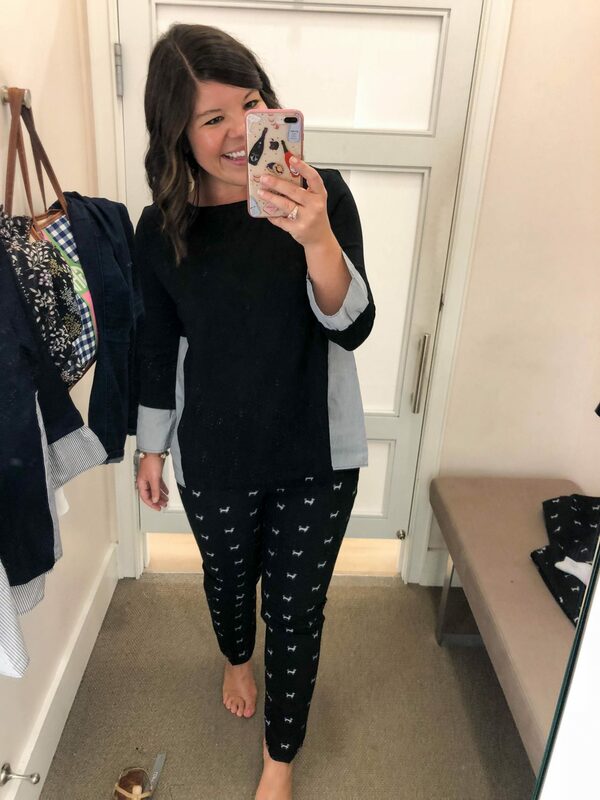 I thought it was pretty fun to pair the black one with these dachshund pants- a whimsical pairing & great fall work look. 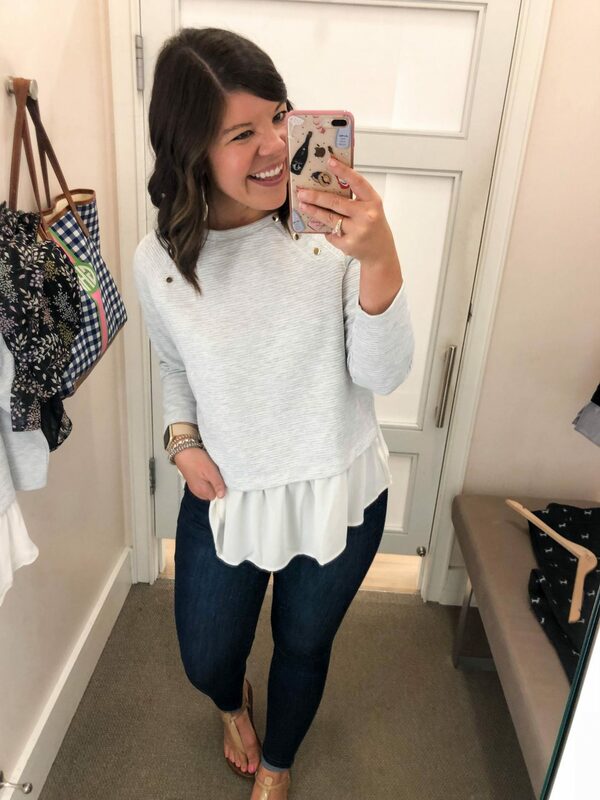 This top is a little bit dressy and a whole lot of fun! The chiffon ruffle just adds a great element to this look & the gold buttons are the perfect finishing touch. So good y’all! A happy polka dot sweater? I mean, who doesn’t need one of those?? Yep, your closet needs these asap! Happy Friday- can we all give a collective woo-hoo for the weekend? I was supposed to be out of town but cancelled my trip at the last minute and I’m actually really excited to spend the next few days here in town. I’ve got the Junior League fashion show Saturday night and I can’t wait to dress up and play with all my girls! I’m kicking off the FASTer Way to Fat Loss on Monday (a week early) so I’m also setting aside a few hours to spend at Trader Joes picking up all my essentials for the first week of the program. Really looking forward to sharing this journey with y’all! Of course I can’t wait for Church on Sunday and to see my sweet babies in the nursery- they are the cutest! Are y’all planning anything fun? 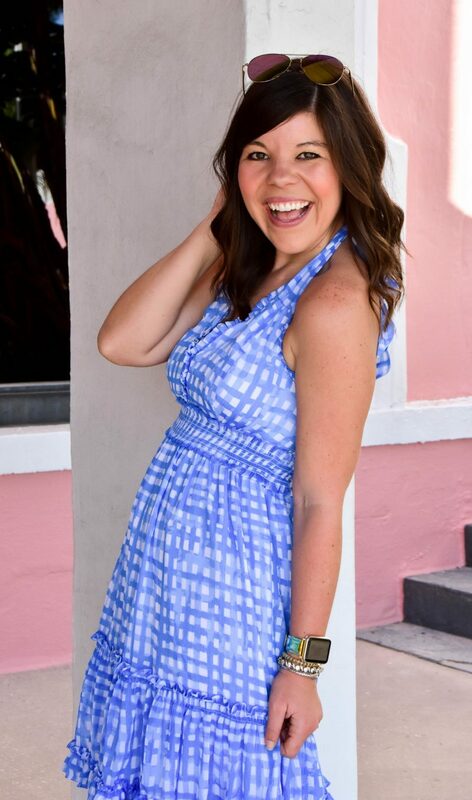 I’m with you about Loft being hit or miss, but SO much cute stuff in this post! I tend to be the same with LOFT’t that funny. 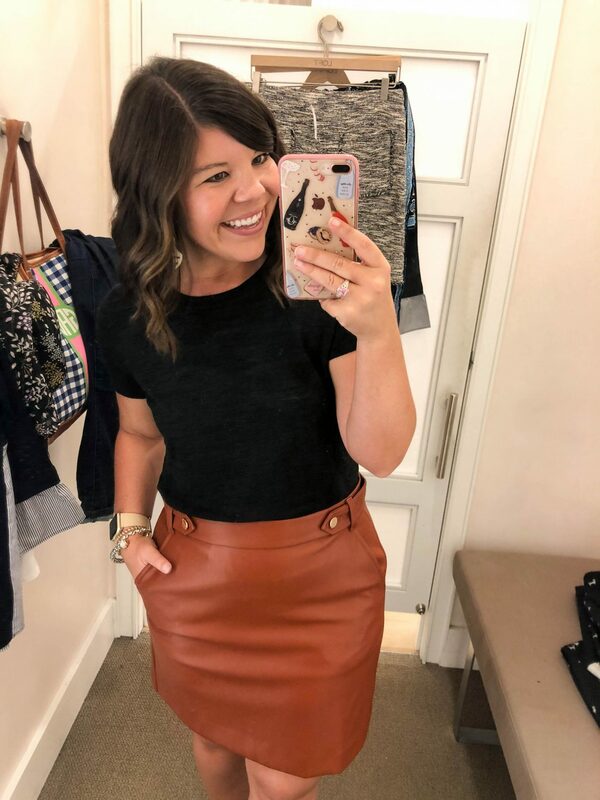 Loving what you found – especially the leather skirts! They are going to be such great closet staples this fall! I’ve been meaning to stop by loft… love that tweed skirt!